Square continues to roll out its suite of tools and services for small businesses. This time it’s Square Payroll, a quick and easy way to pay employees. Square continues to roll out its suite of tools and services for small businesses. This time it’s Square Payroll, a quick and easy way to pay employees. “Existing payroll solutions are complicated, expensive, and typically built for large businesses with salaried employees,” says Square spokesperson Faryl Ury. With the introduction of Square Payroll, the company intends to make paying employees — particularly hourly ones — a whole lot easier. > Timecards are integrated: Hourly employees can easily clock in and out from the register and their hours are automatically imported into the system. > Taxes are taken care of: You don’t have to sweat your federal and state payroll taxes. Payroll automatically handles withholdings, payments, and filings. > Easy setup: Getting up to speed is quick and simple for both you and your employees. And employees can set up direct deposit and access their pay stubs online. > Affordable and transparent pricing: Pricing is $20 a month plus $5 for each employee paid that month. 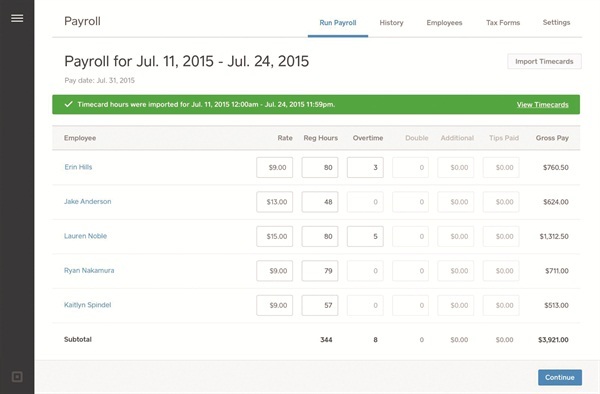 > Versatile: Although built with hourly employees in mind, Payroll works for salaried staff as well. At press time Square Payroll is only available in California, but the company has plans to expand to more states soon. For more information, go to www.squareup.com.